To understand this article, please read Part 1, where it was explained how longer term astronomical cycles are very hard to test because we have only about 200 years of stock market history. Not only that, there are so many astronomical or astrological cycles to chose from that it is almost inevitable that there will be a few of them that seem to match historic stock market movements quite well. Correlation is not causation, so we cannot be confident that these observed long term patterns will recur. But that doesn’t mean we have to give up on trying to find and use long term cycles. When different cycles/rhythms are at work simultaneously, then combined cycles may emerge. A well known example is the ocean tides. Both the moon and the sun have a significant gravitational pull on our planet and that results in tides. The tidal cycle is in harmony with both the solar and lunar cycle, but differs in length from both of them. We can also consider the example of a musician who strikes a chord on his guitar. He is hitting two or three different strings/tones at the same time, but what we hear is the combined tone. In the same way, if planets have an effect on stock prices they are likely to do so through some combined cycle. And then all we need to do is find that combined cycle. Just like the captain of a ship only needs to know the tidal cycle to know when he can enter or leave the harbor. He doesn’t need to know the cycles of the constituent parts: the sun and the moon. In the same way, if we can find a combined cycle of planets that rhymes with the stock market then we don’t need to consider any individual planetary cycles of Mars, Jupiter, and so on.. This is the ancient idea of harmony of the spheres as proposed by Pythagoras. All nice and good, but can we find such a combined cycle that may work in the stock market? So let’s start with our nearest neighbors, Venus and Mars. Venus needs 224.7 days to orbit the Sun, while Mars has a cycle of 686.97 days. They conjunct each other every 333 days (heliocentric), but the more interesting period is 666 days, because then they return to the same part of the sky with only a small drift every 666 days. This is the combined cycle of Mars and Venus, and you may want to watch it. Look what happened 11 months ago and 22 months ago, and see if things repeat. But it gets more interesting when we can include even more planets. Notice how we have very close to three quarters of a cycle in each of these cases. This means that now 3 planets, Venus, Earth and Mars return to the same relative constellation in the sky, but with a 90 degree drift every 666 weeks. The 666 day frequency also has an interesting connection with the planet Jupiter. Jupiter orbits the Sun in 4332.59 days (11.86 years). The implication is that by considering the 666 day and 666 week cycles you are basically using a combined cycle of Venus, Earth, Mars and Jupiter. That’s why some cultures considered the number 666 so significant. In the same way we can also look at Saturn and beyond. Saturn has an orbital period of 10759.22 days (29.46 years). 32277.66 / 4332.59 = 7.45 cycles of Jupiter. So for every 3 cycles of Saturn we get very close to 7.5 cycles of Jupiter. This is a 88.37 years period and it is also interesting for other reasons. It is almost exactly 8 sunspot cycles ( 11 years), and it also resonates quite closely with Uranus ( 84.3 years cycle) and the half cycle of Neptune ( 164.8 years). This could well be the longest combined cycle that has use in the stock market. Is there is any evidence that these cycles are at work? Well, I have looked into long term correlation on stock data going back to 1790, and for the 666 day cycle the result was negative. For the 666 week and 88.4 year cycles a positive but weak correlation is found. So, at best, these planetary cycles have weak effects that are easily overthrown by other factors. On a 200 year monthly chart we see two similar periods standing out: 1830-1840s and 1920-1930s. In both cases the market surged to a significant peak that would not be surpassed for more than 20 years, only to drop towards a 30 year low within years. If this has anything to do with the 88.4 year cycle, then look for a major peak within the next few years, followed by a massive crash that takes the market to 30 year lows. Based on the earlier major peaks in 1835 and 1929, we would expect this blow-off peak to occur between 2012 and 2017, followed by a major low in 2020-2022. As we have only two observed cycles it remains to be seen whether this pattern will show up. 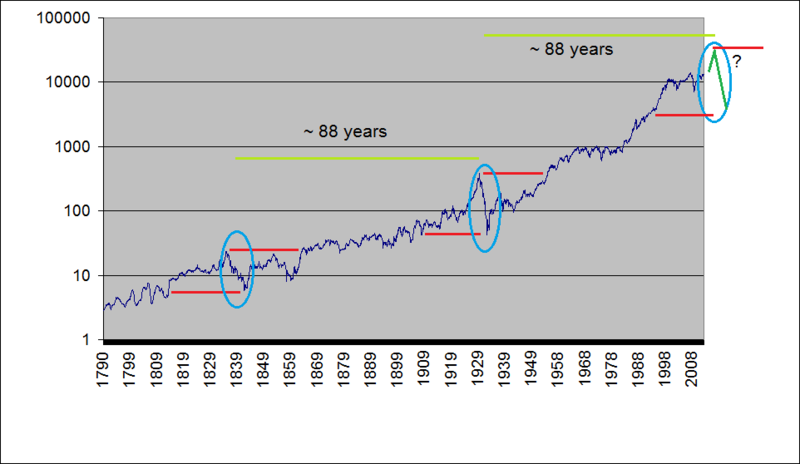 But if it does we would get some nice confirmation for this 88 year cycle. If 88.4 years is indeed a major wavelength in the stock market, then we would also expect so-called overtones or harmonics. Overtones occur for a number of reasons, and most typically they are integer multiples of the main frequency. For example if we divide 88.4 years by 5 we get 17.68 years. This could be the 17.6 year cycle that Kerry Balenthiran has proposed in his recent book. It is exactly 3/5th of the Saturn orbital period. 3140 / 224.7 = 13.974 cycles of Venus. It is also quite close to 2/3rd of the 4666 day cycle. Actually, if 3140 = 1000 * π (pi) , then 4666 = 1000 * δ , the first Feigenbaum constant, which is as important for chaos theory as pi is for geometry. With that I will finish this exploration. This entry was posted on October 31, 2013 at 12:11 pm	and is filed under Financial Astrology. Tagged: 4666, 666, financial astrology, Jupiter, Mars, Martin Armstrong, planets, Saturn, Venus. You can follow any responses to this entry through the RSS 2.0 feed. You can leave a response, or trackback from your own site. Information can be both a blessing or a curse, depending on how we use it for ourselves. So, it is not really the advisor (or his advice) that helps you, but it is a question of the reader helping himself based on the pieces of information he gathers. More different advisors or more different systems are not necessarily helpful, because it depends on how many different sources of information a given person can digest without getting confused by the multitude of different opinions. Some of the most succesful investors typically use only one or two systems. Thanks for this very interesting post, I find your approach more sensible than the average financial astrologer. When I have time I will try to reproduce results from Bradley’s booklet. Where did you find DJIA back to 1790? The best I could find is daily close back to 1885. Don’t know exactly where I found them. The DJIA prior to 1885 was reconstructed based on records of stock prices before the DJ indexes were introduced.